Ideal for keeping your little one warm and cosy and so very quick to knit. Knitted in the round on double pointed needles using double knitting yarn (light worsted) they are great for using up those bits of yarn left over for larger projects and also ideal for the charity knitter. SKILLS REQUIRED: You need to be able to knit in the round using double pointed needles, purl, increase and decrease. Links are given in the pattern for helpful videos. YARN: One pair can be made with 30g of DK weight yarn. 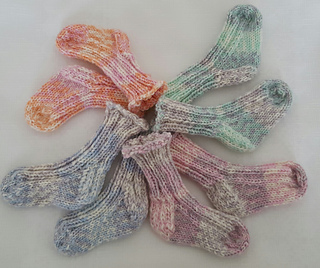 NEEDLES: The socks are knitted in the round using double pointed needles. Easily adapted to work magic loop method if you are familiar with the technique.